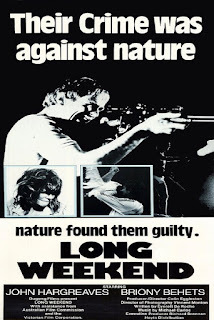 A two-handed microcosm of ecological collapse, this Australian entry in the 70’s eco horror cycle captures an escalating series of quietly disturbing incidents en route to a nihilistic conclusion. It’s closer in tone and execution to THE BIRDS and FROGS, with an unforgiving attitude typical of post-NIGHT OF THE LIVING DEAD horror. 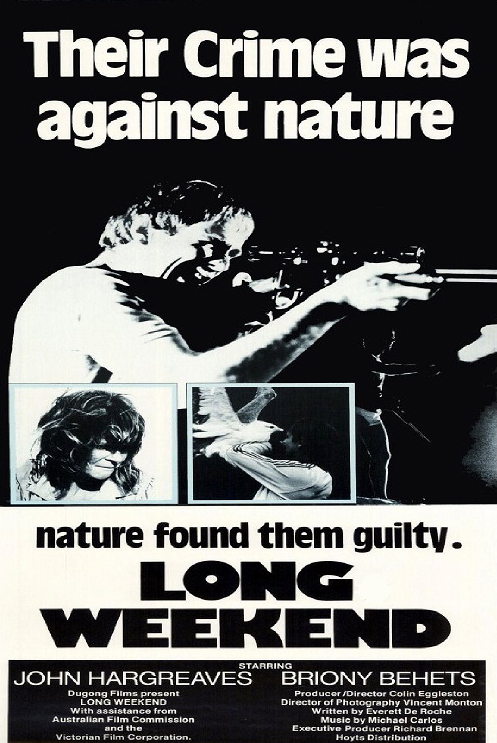 Misanthropic even by the standards of this particular sub-genre of horror, it offers a pair of remarkably unsympathetic leads: bad-tempered John Hargreaves slings bottles into the sea, shoots at wildlife to affirm his masculinity and runs over a kangaroo en-route to his secluded beach weekend getaway with wife Briony Behets. She has just had an abortion to terminate the baby from an illicit liaison. Nature strikes back in subtle yet increasingly harsh ways, as defrosting chickens rot inexplicably, unspecified screams keep them awake at night and a nod to JAWS involves an unidentified black shape creeping up on Hargreaves while surfing. Everett De Roche’s screenplay offers only fleeting glimpses of the bigger picture via radio reports of atomic tests and TV discussions of unexplained bird attacks. We assume the fate befalling these two characteristically selfish representations of humanity awaits many others away from the lonely beach. Petty bickering and a reckless attitude toward the environment pay off with a denouement rich in grim irony. It’s a masterful exercise in mostly suggestive horror, and the only genre film in which even an innocent exchange such as “What do you want for tea tonight- steak or chicken?” / “What’s wrong with fresh fish?” carries a disturbing charge.